Clunking, Banging, And Rattling, Oh My! Are you hearing concerning noises from your heater? If you are, you need a service professional at your side as soon as possible. Any noise that isn’t the very innocuous, soft sound of air moving through the ventilation system or a soft click upon start up is “concerning.” Pay attention to the noises that your furnace makes to ensure that you don’t run into a nasty system breakdown. The term “short-cycling” is HVAC-speak for the phenomenon where your heater switches on, runs for a frustratingly short time, switches off, and then starts up again shortly after. When this happens, you’re likely having an insidious problem with the heating system. Short-cycling is typically the first symptom of a big heating problem on the horizon—if you’re experiencing this, call us! Notice a lot of dust in your home? This is actually a problem with your heating system. We really like to underscore this issue because it’s one that homeowners often brush off or don’t realize is a problem that stems from the heating system. When you see an endless amount of dust in your home it’s because it’s constantly getting circulated in the ventilation system. You need an HVAC professional from our team to assess your ductwork and determine if you need any additional sealing or repair services to stop this problem in the future. You might be thinking, “Wait, aren’t we talking about the subtle signs?” Although a lack of heat coming from your heater doesn’t sound subtle, you’d be surprised what homeowners write off. 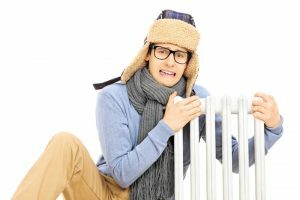 When we’re in the dead of winter, lots of homeowners figure that their heater is just struggling to battle against the cold temperatures when in actuality their heating system has been on the decline for months. If you find yourself layering up more and cranking that thermostat up to no avail make sure you call a professional. Notice that dry winter conditions seem a little extra dry this year? If you notice that your skin and hair seem extra dry, your nails keep breaking off, or that you’re always getting shocked whenever you go to open a door then that means your air in your home is too dry. Your heating system affects this. An old or faulty furnace will create dry conditions in your home. If this is a problem you’re having then it’s worth calling a professional technician for help. Contact Switzerland Air for all your heating services this winter.